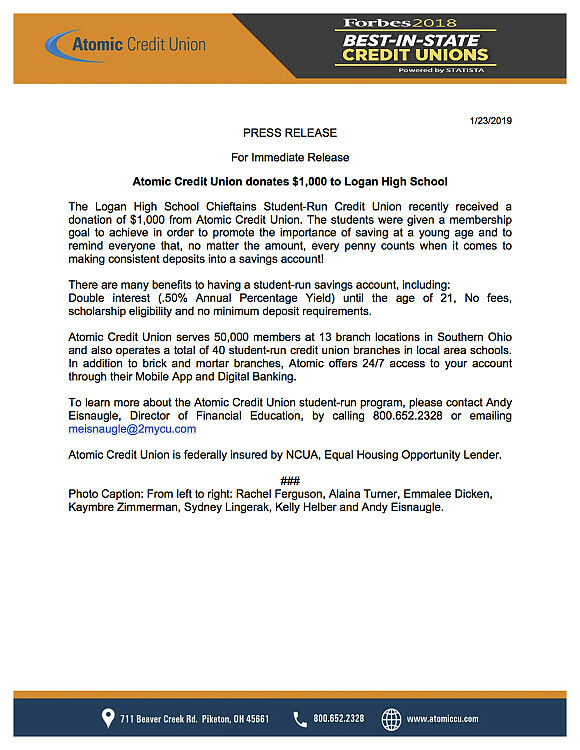 The Logan High School Chieftains Student-Run Credit Union recently received a donation of $1,000 from Atomic Credit Union. The students were given a membership goal to achieve in order to promote the importance of saving at a young age and to remind everyone that, no matter the amount, every penny counts when it comes to making consistent deposits into a savings account! Double interest (.50% Annual Percentage Yield) until the age of 21, No fees, scholarship eligibility and no minimum deposit requirements. Atomic Credit Union serves 50,000 members at 13 branch locations in Southern Ohio and also operates a total of 40 student-run credit union branches in local area schools. In addition to brick and mortar branches, Atomic offers 24/7 access to your account through their Mobile App and Digital Banking. Atomic Credit Union is federally insured by NCUA, Equal Housing Opportunity Lender. Photo Caption: From left to right: Rachel Ferguson, Alaina Turner, Emmalee Dicken, Kaymbre Zimmerman, Sydney Lingerak, Kelly Helber and Andy Eisnaugle.